Memorial Day, Savage, Minnesota, June 2009, photo © 2013 by QuoinMonkey. All rights reserved. 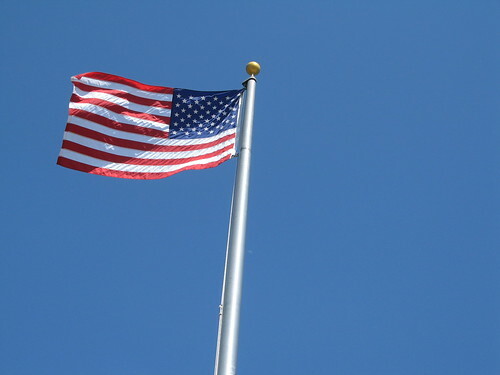 Memorial Day, a somber remembrance of the men and women who gave their lives in U.S. wars. I am fortunate; I only know of one family member who died while fighting a war—my Uncle James. When I visited the Vietnam Veterans Memorial at its dedication, I did a rubbing of his name (Panel 20W – Line 32). And when I started blogging, I discovered the Vietnam Veterans Memorial website where I began leaving him messages each Memorial Day. Uncle James died seven months into his tour, in Binh Long, South Vietnam, a long way from his South Carolina home. This is the time I dedicate to him. Yesterday, I listened to CBS Sunday Morning and was taken with Lee Cowan’s story of Charlie Haughey, a Vietnam war photographer. It reminded me of the importance of photographs to remembering the dead. During his service as a photographer in Vietnam, Charlie Haughey chronicled the daily life of soldiers in his battalion. When his tour ended, he dropped his nearly 2,000 photo negatives into a shoebox, and hid them away. Now, after 45 years, Haughey’s mesmerizing images of soldiers battling the physical and emotional hardships of war are seeing the light of day. You can see in his eyes, they still bring him pain. To all of the fallen, and for Uncle James. Never forgotten. 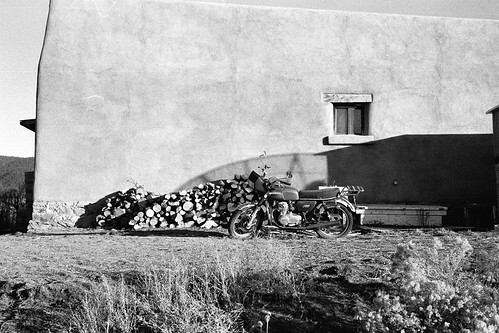 Motorcycle In Taos – 2/365, Archive 365, Taos, New Mexico, January 2003, Tri-X black & white film print, photo © 2003-2012 by QuoinMonkey. All rights reserved. I miss black & white photography. I recently felt the old pangs for film when I ran into Tricia Vetrone’s work at Ingrained Photography while looking for peers for our Casket Arts 318 studio page (our brick and mortar art and writing studio. Would love it if you Liked us there). She shoots in black & white with vintage film cameras. Beautiful work. Motorcycle In Taos was taken on one of my first writing retreats in Taos in 2003. It was a talking workshop, long before the silence befriended me. We were walking around the Mabel Dodge Luhan House with Natalie. 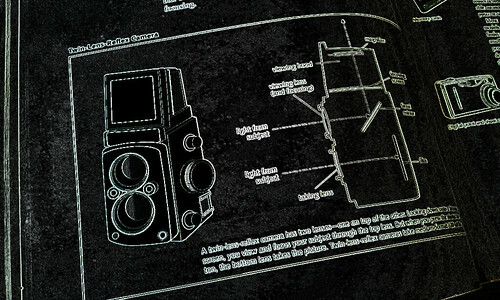 I didn’t own a digital camera then and was still shooting with a Canon Rebel film camera and trusty Kodak Tri-X b&w. It’s sad to me that Kodak declared bankruptcy this year. In a long history that began in 1888 with the slogan “you press the button, we do the rest,” George Eastman put the first simple camera into the hands of a world of consumers. He made a cumbersome and complicated process easy to use and accessible to nearly everyone. I’m sure in his wildest dreams he never imagined we’d be taking digital photos on our cell phones. Time changes everything; photographs capture time. 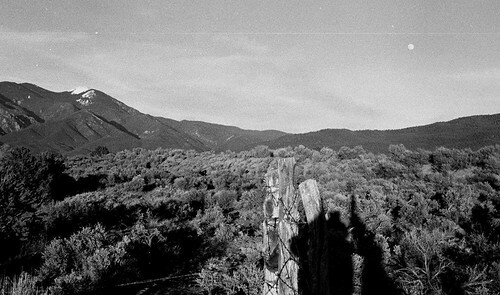 Moon Over Taos Mountain, Taos, New Mexico, January 2003, Tri-X black & white film print, photo © 2003-2011 by QuoinMonkey. All rights reserved. December marks a time of darkness and silent reflection leading up to the Winter Solstice. Most Decembers, Natalie holds a writing retreat around the time of December 1st through 8th. In Zen, this time is called Rohatsu Sesshin and marks the enlightenment of the Buddha, Siddhartha Gautama. For those heading to Taos to write, it’s a time of community solitude, an opportunity to go within. 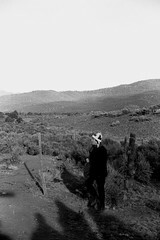 Slow Walking, Natalie Goldberg, Taos, New Mexico, January 2003, Tri-X B&W film print, photo © 2003-2011 by QuoinMonkey. All rights reserved. This week ybonesy and several other writing friends will be making the jouney to Taos to sit in silence. I find comfort in knowing they will be there under Taos Mountain. When they sit, they sit for all of us. The zendo casts a wide circle. Everything is connected. We can sit and write in solidarity. There will be long nights under Mabel’s lights and slow walks into Taos. Some will walk the morada, visit the graves of Mabel and Frieda, soak up places that Georgia walked on her first visits to New Mexico. Notebooks will be filled with Writing Practices, later to be reread. Whatever’s at the surface will fall away. What’s important is what is underneath. Underbelly. Sit, Walk, Write. With Gratitude to a long lineage of mentors and teachers. For all that has come before. And all that will be. Note: ybonesy and I met in Taos at a Writing Retreat. We’ll be forever connected by that thread. And the practice that became red Ravine. We’ve written many pieces on our time spent in Taos. To learn more about Sit, Walk, Write or our experience of studying with Natalie Goldberg at the Mabel Dodge Luhan House, check out the links in this post. Or click on any of the posts under Taos. With Gratitude to our readers, those at the Mabel Dodge Luhan House, Natalie, and all the writers and artists who keep showing up to brave the silence. We are all in this together. © 2009 by ybonesy. All rights reserved. I knew her smiles. I saw her dimples and I saw her straight teeth, and I saw the dance in her eyes, but I never saw the smile she’s wearing in that photo. That is the smile of a woman in love. An adoring smile. Look at it. That is the smile that tells me Roma was a woman and a lover and a friend before she ever became my grandmother. My Aunt Sophie, the oldest of my grandmother’s children, wrote an essay about her mother. The following are excerpts taken from that piece. Roma was my mother. I wonder what my grandparents were thinking when they named her Roma. Her family called her Romey, her friends called her Romana, and close friends and relatives called her Romanita. Her birthday was February 28, 1904. A very special date to be born. It was the day before Leap Year. I can verify that she was special. She was beautiful, she was romantic and adventuresome…She loved deeply, and others loved her because of her friendliness and her ability to reach out to others. She was born of an era when being poor was fashionable; a time when adults told stories to children about caves, trains, owls, witches and demons; it was one way of keeping the children at home in the evenings. Roma was a wonderful story teller. She loved to make up stories and songs and dance and laugh, all in that order. I like to think about who Roma was before she became a grandmother. She grew up in the mining camps of northeastern New Mexico. She went to public schools with the children of immigrants from Italy, Romania, and Yugoslavia. 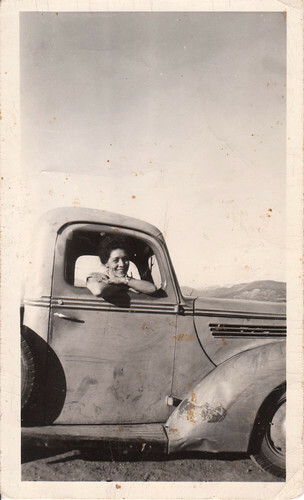 She was 16 when she married, a handsome New Mexican who was killed in one of the state’s worst mining accidents. At the age of 18, Roma became a widow with two children, the youngest not even a month old. Then she met my grandfather. When we were children, Roma sang us songs using the sounds of her childhood. The words did not make much sense, but the melodies live in us to this day. Hanti-Nanche tu ti maja, mata tu san ches san a ma way. Another song, a blend of English and Spanish, went like this: Cuando estaba chiquitita me decía me mamá, Pretty Baby, Pretty Baby. I always wonder who took that picture of her in the truck. How old was she? It’s hard to tell. I imagine it was my grandfather, her second husband. Everyone called him Sandy, even his kids. He was a cowboy. They lived on a ranch, seven miles from school and Cimarron, the real Wild West. Where pavement ends and Hell begins. I always enjoyed looking at my mother’s profile when I was working with her at some project. She had an abundance of rich, black hair, and depending on what she wore, her eyes were sometimes green and sometimes blue and she had this mischievous smile. Sometimes I wondered what she was thinking, and I wondered too why a woman of this beauty would be living out here where only the cattle roam. “Assassin’s Bullet Kills Kennedy” – Where Were You? 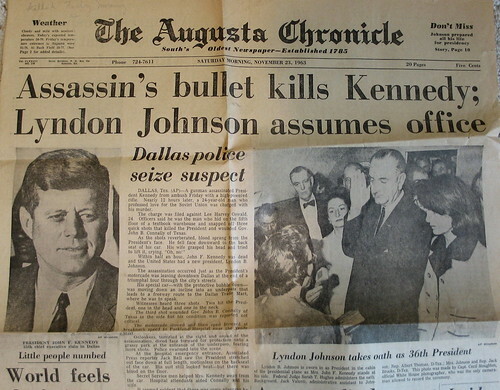 Assassin’s Bullet Kills Kennedy, vintage newspaper found last summer in a box of old family photographs, November 23rd, 1963, The Augusta Chronicle — South’s Oldest Newspaper — Est. 1785, Augusta, Georgia, photo © 2008 by QuoinMonkey. All rights reserved. The Kennedy assassination rattled me as a child. I wrote about it a few years ago, and discovered Bryan Woolley’s Dallas Times Herald account of the facts from the morning of November 22nd, 1963. It was strange to be holding a yellowed newspaper from that day, one that had circulated through the town where I was born. 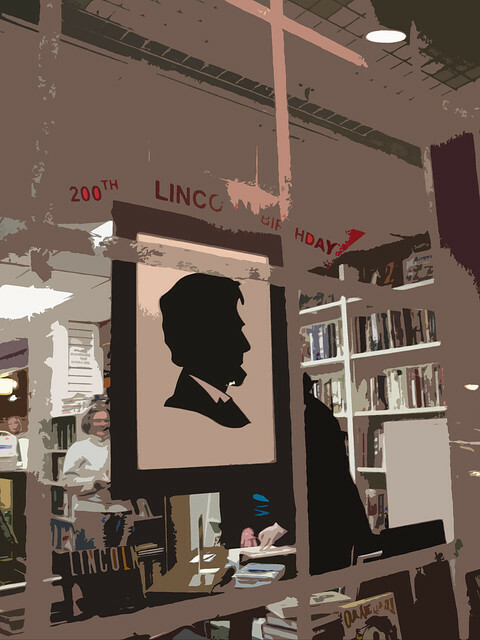 There were front page interviews, reactions of everyday people walking down Broad Street. Where were you the day Kennedy was shot? Though I was young, I clearly remember the headline photograph of LBJ, Lady Bird and Jackie. It wasn’t until later I would learn it was taken aboard Air Force One by White House photographer, Cecil Stoughton, at the swearing in of Lyndon B. Johnson. Stoughton was close to the Kennedys and rode in the fifth car in the motorcade. He heard the shots that fatally wounded JFK; he was at Parkland Hospital when Kennedy died. 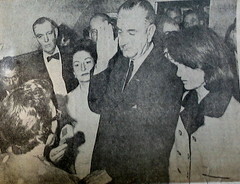 The Augusta Chronicle Caption — Lyndon B. Johnson is sworn in as President in the cabin of the presidential plane as Mrs. John F. Kennedy stands at his side. Federal Judge Sarah T. Hughes administers the oath. Background, Jack Valenti, administrative assistant to Johnson, Albert Thomas, D-Tex; Mrs. Johnson and Rep. Jack Brooks, D-Tex. This photo was made by Capt. Cecil Stoughton, official White House photographer, who was the only camera-man allowed to record the ceremony. Out of the 12,000 negatives Stoughton shot during the Kennedy years, none would be as important as these – he was the only photographer allowed aboard Air Force One that day. And his were the only shots that proved Johnson had actually been sworn in. According to Stoughton’s son, “He took about 20 pictures but the first one almost didn’t happen because his Hasselblad, the Rolls-Royce of cameras, malfunctioned.” A photographer’s nightmare. woman to administer the presidential oath, was shaking. and went to get it. 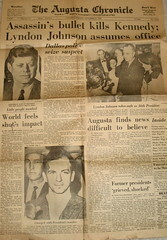 LBJ & Jackie Kennedy, JFK In Augusta Chronicle – “Little People Numbed,” Lee Harvey Oswald, shots of vintage copy of The Augusta Chronicle, November 23rd, 1963, Augusta, Georgia, photo © 2008 by QuoinMonkey. All rights reserved. 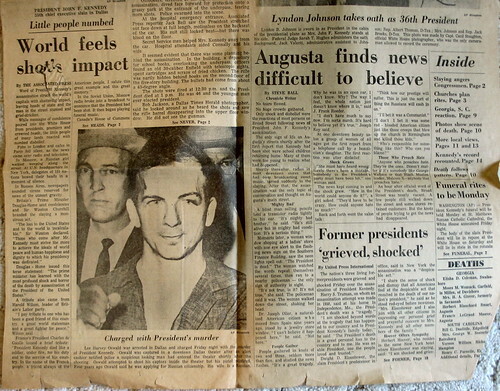 The Augusta Chronicle Caption — Lee Harvey Oswald was arrested in Dallas and charged Friday night with the murder of President Kennedy. 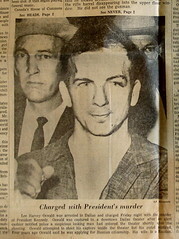 Oswald was captured in a downtown Dallas theater after an alert cashier notified police a suspicious looking man had entered the theater shortly after the shooting. Oswald attempted to shoot his captors inside the theater but his pistol misfired. Four years ago Oswald said he was applying for Russian citizenship. His wife is Russian. Stoughton had an amazing collection of photographs and memorabilia. He appeared on Public Television’s Antiques Roadshow in June 2007 where they estimated his collection at $75,000. Cecil Stoughton died a few weeks ago, on Monday, November 3rd, 2008. By some odd twist of fate, a pre-scheduled, taped segment of his 2007 Antiques Roadshow episode was rebroadcast that Monday night, about an hour after he died. World Feels Shot’s Impact, vintage copy of The Augusta Chronicle — South’s Oldest Newspaper — Est. 1785, November 23rd, 1963, Augusta, Georgia, all photos © 2008 by QuoinMonkey. All rights reserved. There is one last thing that struck me about The Augusta Chronicle account. Above the headline World Feels Shot’s Impact is a smaller headline — Little People Numbed. It reminded me of our recent presidential elections in this country, how the whole world was watching — and how it was the little people — everywoman, everyman — who really made the difference. Word of President Kennedy’s assassination struck the world’s capitals with shattering impact, leaving heads of state and the man in the street stunned and grief-stricken. While messages of condolence poured into the White House from presidents, premiers and crowned heads, the little people of many lands reacted with numbed disbelief. Pubs in London and cafes in Paris fell silent, as the news came over radio and television. In Moscow, a Russian girl walked weeping along the street. At U.N. headquarters in New York, delegates of 111 nations bowed their heads in a moment of silence. In Buenos Aires, newspapers sounded sirens reserved for news of the utmost gravity. Britain’s Prime Minister Douglas-Home sent condolences and Sir Winston Churchill branded the slaying a monstrous act.